If you spend a lot of time at Bayne Library you may be lucky enough to meet Amanda Balph. She is not only the former owner of this Victorian home turned library, but she is also said to be its resident spirit. 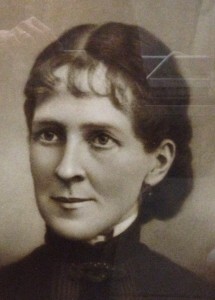 Mrs. Balph was born in 1846 to Andrew and Mary Anne Bayne. Andrew Bayne owned a large property in the northeast corner of Bellevue. Upon her marriage in 1870, Bayne gave his daughter some of the land upon which she grew up to build her home. Her husband, James Madison Balph, was an architect and he designed and built their dream home. The couple moved into the refined three-story Victorian mansion in 1875. James Balph died in 1899 leaving Amanda alone in the home for the remainder of her life. She lived a quiet life, enjoying her book collection and the lovely property with it’s host of elm trees. When she died in 1912, Mrs. Balph deeded over her home and the acreage surrounding it to the Borough of Bellevue. The transfer took place with four stipulations: the four acre plot would not be developed, her home would be used a public library, the streets bounding the property would be renamed Balph and Teece, and the elm trees on the property would not be removed. The Borough has honored Mrs. Balph’s requests with one exception, they were not able to save the elm trees. Throughout the last century the trees succumbed to Dutch Elm disease and had to be removed. The last surviving tree, known as the Lone Sentinel, was removed in 1998 when it was determined that it too could not be saved. Many reported that during this time period Mrs. Balph’s ghost became more active.